Dental implants are transforming the lives of our patients by replacing missing teeth with beautiful, healthy, natural-looking smiles. Dental implants provide the foundation for full-functioning replacement teeth which allow our patients to eat and smile with renewed confidence. 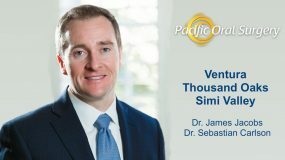 Pacific Oral Surgery has offices in Ventura, Thousand Oaks, and Simi Valley offering excellence in specialized patient care with state-of-the-art technology. Our oral surgeons are highly trained and skilled in placing dental implants to replace missing or damaged teeth comfortably and accurately in the fastest and safest time frame possible. Dental implants are metal (titanium) posts, which are surgically implanted into the jawbone to replace the roots of teeth that are damaged or missing. Implants provide a strong foundation for a new artificial tooth (prosthetic). By providing a strong foundation for new replacement teeth, dental implants allow patients to regain their beautiful smiles with teeth that function and look like natural teeth. Dental implants are a common oral surgery procedure and an innovative alternative to fixed bridgework and dentures, which can be uncomfortable. Implants will not slip, decay, make noise, or cause bone damage like some other treatments are prone to do. Beyond the simple fact that missing teeth have a negative impact on one’s appearance, missing teeth can also impact other areas of your life. Most immediately, eating is far difficult without a full set of teeth. Additionally, without all of the teeth in place to stimulate the jawbone, the jawbone will begin to atrophy, which leads to a sunken-in appearance to the whole face. Last but not least, after one tooth is missing, the remainder of the teeth will suffer, and are more likely to fall out of alignment, or fall out completely as well. Dr. Jacobs, premier oral and dental implant surgeon in Ventura County, and his team offer single-tooth replacement implants, partial prostheses (used to replace 2 or 3 teeth), and complete prostheses (to replace an entire upper or lower arch). The oral surgeons at Pacific Oral Surgery can map out your entire dental implant procedure through the use of 3D imagery, specialized software, and a digital model of your mouth prior to your oral surgery. 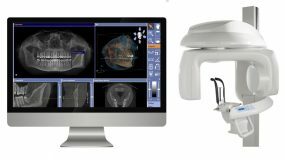 This advanced and innovative technology allows for greater precision and a faster dental implant procedure for our patients. Single-tooth prosthesis: A prosthetic tooth (crown) is attached to an implant to replace a missing tooth. A fixed bridge partial prosthesis utilizes 2-3 single dental implants. All-On-4 dental implants (New Teeth in One Day): Four dental implants are used to support a full fixed bridge of 10-14 teeth. Bar attachment denture: Complete and permanent dental prosthesis that is secured within the jaw. The oral surgeons at Pacific Oral Surgery in Ventura County are specially trained and experienced in the most recent advances in dental implant surgery technology. They work together as a team with your dentist to make your dental implant procedure a smooth and successful event. New advances, such as guided dental implant surgery which is performed at Pacific Oral Surgery, now allow dental implants to be placed in less time than ever before. Single tooth replacement no longer requires 2 surgeries in every case. In fact, in most cases, a dental implant can be placed in the comfort of our office (sometimes at the same time of tooth extraction) with very little disruption to the patient’s routine. During most dental implant procedures, patients are given either local anesthesia or intravenous sedation. Since the healing process can take between 6 and 8 weeks in most cases, we provide you with a temporary prosthesis to replace the missing tooth. This prosthesis not only looks natural, but also provides the patient with a functional placeholder for the time being. Once the healing is complete, the temporary prosthesis is removed, and the permanent prosthesis is placed in a simple and quick office procedure. More extensive implant procedures, such as those requiring bone grafting, can involve several months of treatment depending on the condition of the patient’s jawbone and how much preparation is required prior to implant placement. Once your dental implant procedure is completed, routine oral hygiene (brushing, flossing, and regular dental appointments) is typically all that is required for you to enjoy your new replacement teeth for a lifetime. In previous years, replacing a missing tooth was time consuming, uncomfortable, and fairly limited. In fact, one of the only option available was removable dentures, which had a tendency to slip around, make noticeable noises, and make one’s eating experience less than pleasant. Dental implants, on the other hand, are designed to be much less noticeable, and permanent as opposed to removable. 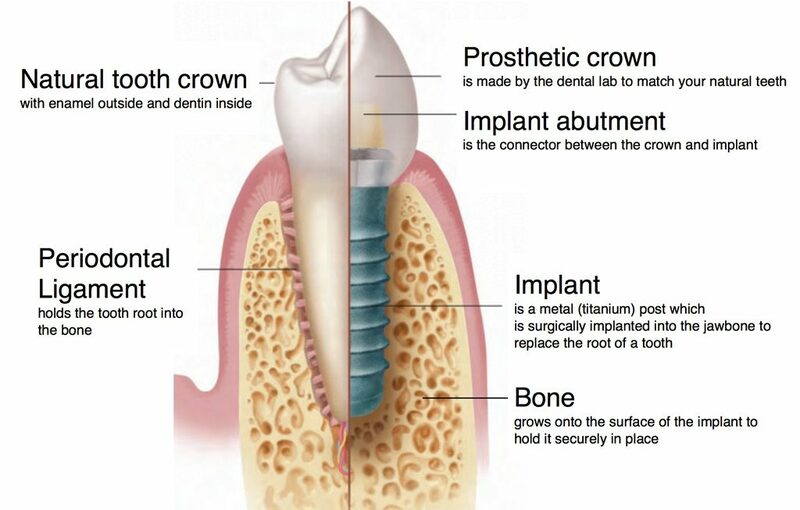 This is because dental implants replace the tooth, or several teeth, completely from the root to the crown. Since the root of the tooth is properly substituted with this method, the jawbone can fuse around the implant, so the bone won’t deteriorate, and the facial structure will remain unchanged. Improved oral health: Implants can be cleaned and cared for like natural teeth and do not increase gum disease, tooth decay, or sensitivity as some teeth replacements can. Highly successful: Dental implants have over 95% success rate for replacing missing teeth. Enhanced appearance: Dental implants typically replace missing or damaged teeth and can be matched to the color of your natural teeth. Comfortable: Implants are fused into the bone and become permanent, allowing them to feel like natural teeth. Improved oral health: Unlike with bridgework, other teeth are left intact. Implants allow easy access between teeth for cleaning. Durable: With proper care, dental implants can last a lifetime. Improved self-esteem: Patients can smile with confidence knowing that their teeth look natural. Dental implants can be used to replace a single tooth or to secure a fixed denture (group of teeth). Implants can also be used to support an entire arch of teeth. Before dental implant surgery, you will need a comprehensive oral evaluation. Dental x-rays will be taken, and a model of your teeth and mouth will be made. Once it has been determined that dental implant surgery is the best choice for you, your surgeon will design an individualized treatment plan to suit your particular needs. Your Pacific Oral Surgeon will work with a team of other dental specialists, which may include your restorative dentist or periodontist. Typically, your oral surgeon will extract the teeth and place the implants, and your dentist makes and fits the permanent (and temporary, if needed) crowns. The dental implant process is performed in several stages, usually over a few months. First, the damaged tooth is removed and the jawbone is assessed to determine if bone grafting for dental implants will be necessary. Condition of the jawbone is the determining factor on how the dental implant surgery then proceeds. If bone grafting is necessary, your surgeon may elect to use a computer guided dental implant surgery technique. A socket bone graft, or alveolar ridge preservation graft, is a bone grafting procedure performed after a tooth is lost or extracted to fill the void (extraction socket). Whenever the jawbone is ready (either after a healing process or initially), your surgeon will place the dental implant. Depending on the complexity of your procedure, your surgeon may utilize sedation, local anesthesia, or general anesthesia. In most cases, dental implant surgery is performed as an outpatient procedure. To place the dental implant, your surgeon will make an incision in your gum to expose the bone. Holes are then drilled in the jawbone and the post is placed deep into the bone. Unless you need a temporary denture for appearance, you will have a space where the tooth is missing. In some cases, the abutment (connector between the implant and the crown, or replacement tooth) is placed on at this time. Often, however, it is added later in a second procedure. Now begins the critical few months during which the jawbone fuses to the surface of the implant (osseointegration). This bone growth is imperative to provide a strong base for your new teeth, much like the roots of your natural teeth. Once osseointegration has successfully completed, the abutment can be placed to allow the artificial tooth to attach to the implant. Placing the abutment is usually done as an outpatient procedure with local anesthesia. Your surgeon will reopen the dental implant site to attach the abutment, and then close the gum tissue around it leaving the top of the abutment exposed. Your gums will then need approximately another 1-2 weeks to heal. After dental implant surgery, new impressions of your mouth and your remaining teeth will need to be taken in order for your artificial teeth to be made. These crowns will be placed once your jawbone is deemed strong enough to support tooth functionality. 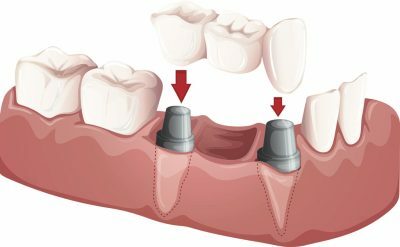 Fixed Dental Crowns and Tooth Bridges: A permanent crown is cemented to or screwed onto the abutment. In this method, several replacement teeth can be bridged together and supported by one implant. Removable Dental Prosthetic or Dental Crown: These teeth securely attach to the abutment with a metal frame that snaps into place. Similar to dentures, the artificial teeth and gums can be taken out to clean or repair. Your oral surgeon may also offer a combination of removable and fixed dental prosthetics that will best suit your lifestyle. You should contact your doctor if any symptoms worsen in the days following your surgery. Some patients require additional pain medication or antibiotics to aid in the recovery process. You will have stitches at the surgery site and will need to eat soft foods for a time during healing. Your surgeon will advise you on specific post-operative instructions for your individual case. On rare occasions, the implant fails to integrate due to loss of bone or gingiva around the tooth or mechanical failure of the implant. Following your surgeon’s instructions and maintaining good oral hygiene are key to the success of dental implant surgery. Selecting a dental implant expert is a critical part of achieving your desired smile. 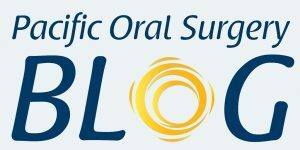 Pacific Oral Surgeons are board certified by the American Board of Oral and Maxillofacial Surgeons and are specially skilled and trained in implant dentistry. With decades of experience, the doctors at Pacific Oral Surgery offer competence and compassion to each of their patients and are committed to providing the highest quality care possible. If you would like to learn more about dental implants, please arrange a consultation with one of our doctors at Pacific Oral Surgery. 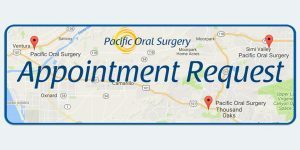 You may submit an online appointment request or call one of our Pacific Oral Surgery offices located in Ventura, Thousand Oaks and Simi Valley. Our team of oral, maxillofacial and dental implant surgeons, welcomes you to our Pacific Oral Surgery practice, and we hope to hear from you soon! Pacific Oral Surgery has three convenient office locations in Ventura, Thousand Oaks and Simi Valley.